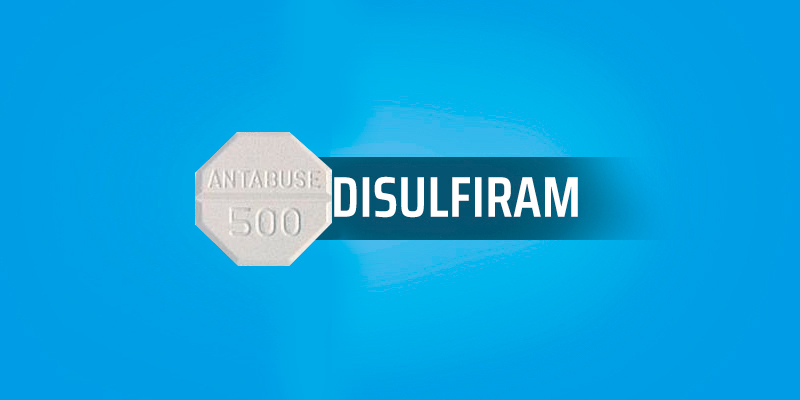 About Disulfiram: Disulfiram can be called an alcohol – antagonist in simple terms. It is actually an inhibitor of the enzyme aldehyde dehydrogenase. Aldehyde dehydrogenase is an enzyme in the pathway of metabolism of alcohol (both ethanol and methanol) in the human body. It converts the acetaldehyde formed during alcohol metabolism to less toxic compounds. High levels of acetaldehyde in the blood can cause distressing symptoms. Disulfiram takes advantage of this fact and acts as a deterrent in those who are treated for alcoholism. Disulfiram was first identified when it was given to two workers as an experimental anti-helminthic drug. It was noticed that both the workers became unwell after drinking at a party, which led investigators to look into this aspect of the drug and finally to the approval of Disulfiram. How Disulfiram Works: Disulfiram is an inhibitor of the enzyme aldehyde dehydrogenase. The action of Disulfiram leads to the accumulation of the toxic metabolite, acetaldehyde. and can also lead to postural syncope (fainting) and cardiovascular collapse, which can be life – threatening. This ‘Disulfiram – syndrome’ occurs every time a person consumes even a small quantity of alcohol and the severity of the syndrome depends on the amount of alcohol consumed. Disulfiram has also got the potential to have dangerous consequences if a large quantity of alcohol is consumed and it is thus very essential that the patient be well informed of this prior to starting Disulfiram. How To Take Disulfiram: Disulfiram is used in management of alcohol addiction and alcohol dependence. It is to be used only in those patients who are highly motivated to change their lifestyle and are willing to stop alcohol consumption completely. When the patient is on Disulfiram, consumption of a small quantity of alcohol will lead to unpleasant symptoms which in turn will strengthen the person’s resolve to quit his drinking habit. However if these unpleasant effects are ignored and the patient continues consuming alcohol, there can be fatal consequences due to build of the toxic metabolite, acetaldehyde. Hence behaviour modification and supportive therapy is of paramount importance before starting a patient on Disulfiram treatment. Disulfiram is available as an oral tablet in the strengths of 250 mg and 500 mg. The first dose of Disulfiram has to be taken only after the patient has been sober for a minimum of 12 hrs. The starting dose of Disulfiram is usually 500 mg to be taken once daily. The dose should not exceed 1g in a day. The starting dose is continued for 1-2 weeks, which is the first phase of treatment. Beyond this, the patient is placed on a maintenance dose which is usually 250 mg as a single daily dose. This dose of Disulfiram has to be continued till the patient has developed a permanent behaviour modification with respect to consumption of alcohol, which may take many months to years. Precautions And Interactions: Disulfiram must never be given to a patient who is under the influence of alcohol, or has consumed alcohol within 12 hrs. It must never be given to a patient unknowingly and every patient should be fully informed regarding Disulfiram before starting therapy. Patients should be advised against the consumption of alcohol in other forms such as cooking vinegar, cough syrups, some toiletries and some cooking sauces or food preparations. If sedation is seen, the drug can be taken at bedtime. More serious side effects of Disulfiram are optic neuritis, peripheral neuropathy, fulminant hepatitis and psychotic reactions. It should be used in caution in patients on phenytoin, oral anticoagulants and isoniazid.